This all sounds a bit mathematical (it certainly is for me) but the European Commission’s probe into Google, prompted by complaints from three of its smaller competitors, goes to the heart of the Google search phenomenon. Google algorithms, a device invented at Stanford University, are the mechanism by which Google arrives at PageRanks, named after founder Larry Page but also meaning just that, page ranks. They assign a numerical value to each element of a hyperlink set of documents, such as those on the internet, to arrive at a measurement of their relative importance. And what Google says goes, at least in the world of search advertising and increasingly all online advertising. The complaint is that Google knowingly uses this system to put its own search services first and ads on its own services first too, thereby distorting the market and penalising competitors. And greatly enriching Google of course. Google has vehemently denied the claims but may well be forced to give way on some elements of its closely-guarded systems if it’s to avoid a long drawn-out and expensive battle with the EU. Microsoft has only just concluded one such that lasted for ten years and cost it millions in fines and countless more in executive time and damage to its reputation. 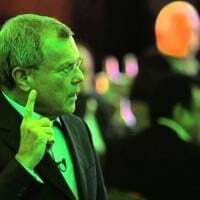 “The decision is a good one because it enables the Commission to look at things that should have been looked at closely before,” according to WPP CEO Sir Martin Sorrell. He think Google should have been prevented from buying DoubleClick, the online ad service that uploads ads and measures their performance. Arguably this reinforces Google’s ability to act as judge and jury in online ad measurement. This is a hot issue for all the ad agencies who gain huge digital revenues from, essentially, acting on the information Google supplies them with. Clients may start to think that the fancy trading desks the big boys are now promoting are just Google patsys, they may just as well hand over the money direct to Sergey Brin and Larry Page (which many people think is Google’s strategy anyway). Online media owners also have worries of course but they will be cheering on the EC (for once), desperate for anything that opens up the Google measurement system to real scrutiny. As for Google, which some analysts rate as the most arrogant company on earth (Apple and Microsoft both have their supporters too) its response to the probe will be a test of whether its motives and practices are good (as it claims) or simply a means of creating an online monopoly.